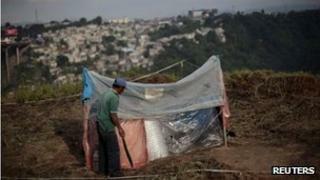 A study by the United Nations suggests the gap between the rich and the poor in much of Latin America is widening. The report by the UN Agency for Human Settlements says that the richest 20% of the population on average earn 20 times more than the poorest 20%. According to the study, Guatemala is the country with the widest disparity, and Venezuela the most equitable one. The survey says the region is the world's most urbanised, with eight out of 10 people living in cities. The report, State of the Cities of Latin America, suggests that by 2050, nearly nine out of 10 Latin Americans will live in cities and its authors suggest Latin American nations use the current period of relative economic stability and slower population growth to make life in the cities more equitable. "The main challenge is how to combat such huge disparities in the cities," Erik Vittrup of the UN Agency for Human Settlements (UN-Habitat) said. According to the study, income inequality in Latin America remains extremely high. "There is a considerable job deficit and a large labour informality affecting mainly the young and women," it says. The report says that Colombia, Paraguay, Costa Rica, Ecuador, Bolivia, the Dominican Republic, Argentina and Guatemala have all seen an increase in inequality between 1990 and 2009. But Mr Vittrup said there were some indications of a positive trend. "We're at the end of an era of urban explosion, with few exceptions. "We're seeing a reduction in poverty, indigence in urban areas; unemployment is going down," Mr Vittrup said. He said that, overall, the region was ready for a transition to quality of life, equity and sustainability.